MoviePass says it has finally nailed down its business model. CEO Mitch Lowe says its latest offer — 3 movies a month for $10 — will make the company sustainable. It has been burning through tens of millions of dollars each month paying for its movie-a-day program. "It is really tough to launch a business that shoots up like a rocket ship, but hasn't completely got the business model right," Lowe told CNNMoney's Christine Romans on "Markets Now." "We now have the right model." MoviePass said last week that it made the change because about 15% of its customers were "stressing the system" — meaning that the company is spending a lot of money paying for the large number of movies those people are seeing every month. Lowe said Wednesday that the top 15% of its customers were eating up about 40% of the company's costs. In May, MoviePass blew through $40 million. The cash burn has taken its toll. Helios and Matheson (HMNY), the parent company of MoviePass, has watched its stock fall 99% since last October. It was trading at about 7 cents per share Wednesday afternoon. Related: MoviePass has a new plan. Again. 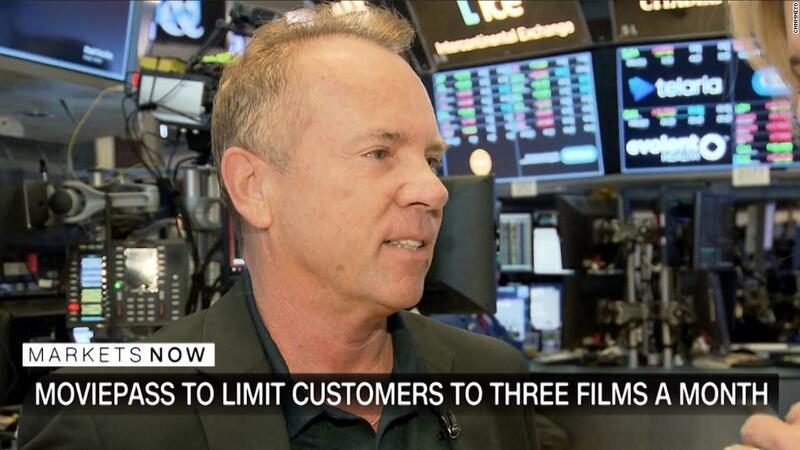 Lowe said he expected that MoviePass might lose some subscribers because of its changes, but said the new plan reflects what the majority of its customers want. "This has been a really tough transition," Lowe added. "We had to really change our model in order to get to profitability quicker than the glide that we were on to get there."